The recent live screening of the much-loved Billy Elliot the Musical has topped the UK and Ireland cinema box offices, with takings of £1.9 million. 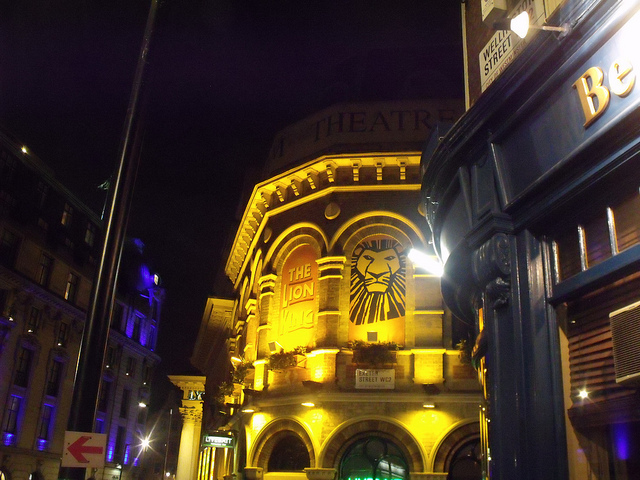 The screening, which was broadcast live from London’s Victoria Palace Theatre to more than 500 cinemas on 28 September, beat new releases such as The Equalizer and The Boxtrolls to the top spot, and was the widest ever cinema release of a live event. This is fantastic news for musical theatre fans – and the industry – in expanding the reach of the musical for new and perhaps unanticipated audiences. The musical, written by Lee Hall with music by Elton John, is an adaptation of Hall’s 2000 film. It is directed by Stephen Daldry with choreography by Peter Darling. The story, set in the mining town of Newcastle during the Margaret Thatcher era tells the story of a young boy’s quest to train at the Royal Ballet School against the odds of social, economic and personal difficulties. 25 former and current Billy Elliots, including the three original performers – James Lomas, George Maguire and Liam Mower – took part in a special finale of the show, which was broadcast to eight countries. Encore screenings of the performance went on to take place at more than 350 cinemas on 2, 3, 4 and 5 October and a DVD of the special event will be released on 24 November. Billy Elliot the Musical is produced in the West End by Universal Stage Productions, Working Title Films and Old Vic Productions in association with Tiger Aspect, and is based on the Universal Pictures/Studio Canal film. The popular musical is currently booking until 19 December 2015, but by expanding its reach through cinema, who knows how long it could run for! It has been rumoured that the hit musical Billy Elliot is to be screened in over 300 cinemas in September. A special matinee performance on 28 September will be broadcast live, with a repeat showing to be broadcast in the evening and Ruthie Henshall, who recently joined the cast as Mrs Wilkinson, will star in performance alongside some special guests making the screenings a milestone in the musical’s history. In addition, the musical has recently announced that it will be continuing its hugely successful run at the Victoria Palace Theatre long into 2015, continuing to delight audiences. The record-breaking show centres around the 1980s miners’ strikes in North East England and Billy’s struggle to break free from his family’s expectations and fulfil his dream of becoming a ballet dancer. The Thatcher-era presented many obstacles but audiences will observe Billy defy the odds and go on to achieve great things. In May 2015, the show will celebrate its 10th birthday, making it one of the longest running shows in London, as well as being a blockbuster film. The feel-good show has recently welcomed its 37th Billy to the cast, and other new cast members, led by Olivier Award nominee and musical theatre icon Ruthie Henshall in the role of Billy’s dance teacher Mrs Wilkinson. Henshall has had a fantastic career in the West End to date, starring in musicals including Les Misérables, Chicago and Crazy for You having trained at the prestigious musical theatre institution, Laine Theatre Arts. As a result, the booking period for the show has been extended until May 2015, with more tickets on sale next month. This will extend the booking period until October 2015, great news for fans all over. Ruthie Henshall Set To Join Billy Elliot Cast! Great news for musical theatre fans everywhere – superstar Ruthie Henshall will be joining the cast of Billy Elliot – The Musical in May to play Billy’s dance teacher Mrs Wilkinson, taking over from current Mrs Wilkinson, Anna-Jane Casey. Ruthie has recently been focusing on her solo performances on tour, and will now return to the West End stage for the first time since 2011. The first performance for Ruthie as Mrs Wilkinson will be on 12 May 2014, nine years to the day since the show officially opened at the Victoria Palace Theatre. Ruthie has become a musical theatre success throughout her years on stage, with other credits including performances in productions such as Chicago, The Woman in White, Marguerite, Les Misérables, Oliver!, Crazy For You, Cats, Miss Saigon and She Loves Me, for which she won an Olivier Award. She was last on stage in Thea Sharrock’s revival of Blithe Spirit at the Apollo Theatre in 2011. Based on the hit 2000 film and set against the mining strikes of the 1980s, Billy Elliot – The Musical recounts the tale of a boy whose father wants him to learn to box but who instead discovers a love for ballet that leads him from secret lessons to a place at The Royal Ballet School. Ruthie, having trained at the prestigious Laine Theatre Arts, has gone onto inaugural performing arts success in a range of roles and performances spanning many years across the industry. She has recently been performing in her own tour, presenting an anecdotal evening of snippets of her life alongside some of the blockbuster hits she is most famous for. This is in addition to her own material which is a testament to her incredible talent and ultimately, her success as a musical theatre artist.